This Norman LS230-1 Boom Arm is ideal for portrait and commercial work where strength and portability are required. It includes a stand clamp and a detachable 5 lb counterweight. 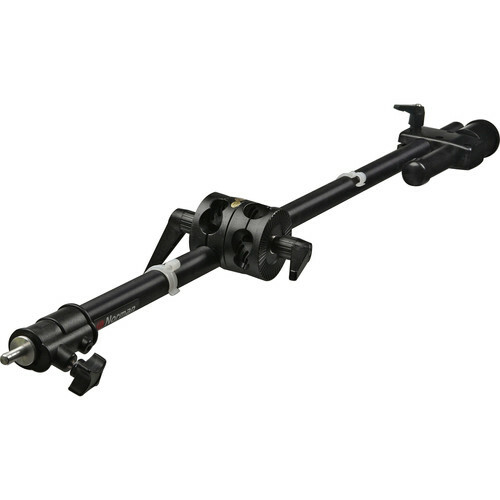 Box Dimensions (LxWxH) 34.0 x 9.0 x 4.0"
LS230-1 Boom Arm is rated 4.4 out of 5 by 18. Rated 5 out of 5 by KWStudios from Perfect Very Well Made and Impressive! The included counter weight is really awesome - makes it so you dont have to cart a separate weight around (depending on application). I use mine to lift a 24x24 Lastolite EZbox hotshoe with a SB900 or 800 flash above the subject and often above the Lastolite triflector. The boom is very heavy duty - for this setup be sure to buy a medium or heavy duty lightstand. Even though the softbox and SB are light - extending this boom 4' to 6' over the subject puts lots of stress on my medium tripod - I may get a larger duty one. This Boom ROCKS - it's solid and better than any others I have seen that sell below $250. Rated 2 out of 5 by JCHanna from Disappointed I was happy to see a boom arm for such a low price with such great reviews, but I can't recommend this product. I'm using it with a 500 BXRi as a hairlight and it flexes without full extension and no modifier. What worries me more is the plastic clamp that attaches it to your light stand. I don't have a lot of confidence in using plastic at the axis with the most stress, plus the clamp design is bizarre. It needs to have a static bolt in the middle. If you loosen one handle and tighten the other you may eventually end up sliding the bolt so far in one direction that the opposite handle falls off the end of the bolt. Dropped light = not cool. Similarly, since the bolt is not static it is extremely frustrating when attempting to change the angle of the boom. You literally need three hands for this. One to loosen the handle on the boom side, another to support and adjust the boom while it's loose, and another to keep the opposite handle from spinning while loosening and tightening. It's just really really poorly designed. The only thing it has going for it is the price. Not for me. Rated 5 out of 5 by Anonymous from Just what I wanted I am a portrait photographer and wanted to be able to hang a hair light above my subjects. I am attaching a Alien Bees 400 light and strip soft box. This boom seems to be exactly what I wanted. I have only used it once so far, but it works with my heavy duty light stand and is pretty stable with the counter weight. Rated 5 out of 5 by Nicholas B. Putz from Great construction and very study boom For the money, this boom is perfect for anyone using AlienBee or comparable light setups. The 14lb counterweight is just right for indoor use (no wind) while extended. Guild quality is actually the exact same as my Impact 9.5' heavy duty Air Stands. I think they are made form the exact same company actually. Just branded differently. Great product. Really enjoy it. Rated 5 out of 5 by jclifton from Exactly right! I picked up this Norman product to boom a mono light off of a 13-foot air-cushioned light stand. It easily is strong enough to hold the mono light and 10 x 36 strip light box. The clamp is plastic but has held up well in use. The clamp is also able to accommodate many different stand tube sizes.